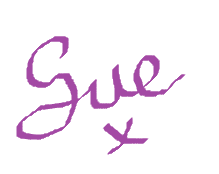 I want to thank Susan for asking me to be a guest blogger. I've never been a guest blogger before! My name is Deb Richey. 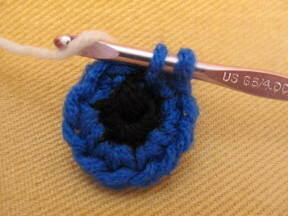 Several years ago, I started as a crochet designer by freelancing for Caron, Intl. A lot of my designs were published in magazines, online and as free project sheets in stores. 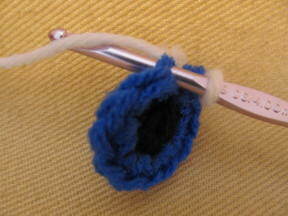 You may have made or recognize something I designed for Caron. 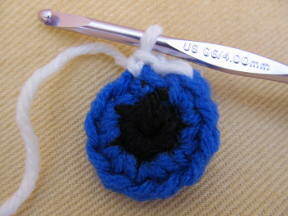 A few years ago I branched out and opened up my own website, www.CraftyDeb.com. I love being able to design whatever sparks my interest whether it be skeletons, kids wearing gas masks or cuter things frogs, bunnies and octopi. I just like to have fun when I design. I'm a perfectionist and have been known to spend ridiculous amounts of time redesigning some of the smallest details just because it wasn't “quite right”. 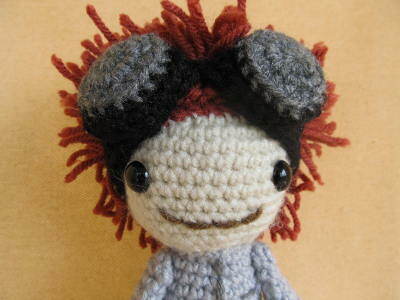 I recently designed a Mad Scientist doll (coming soon to a website near you) and his googles kept me busy for an entire day. It's funny that something that small would irritate me so much but I wanted them to look a specific way and didn't stop until I got it right. I'm glad I did. I love those goggles!! My website's motto is Not Always Cute and Cuddly. You are correct if you assumed that creating Halloween designs is one of my favorite things to dream up. Being a punk rocker at heart and having a house full of boys, I quickly realized that there weren't many designs out there for boys. I still love to create girlie things but I do like to let my inner rebel out. In honor of being a guest blogger and Halloween, I wanted to design something different. I didn't want to make a pumpkin, nondescript monster, bat or spider. I wanted to create something wearable. 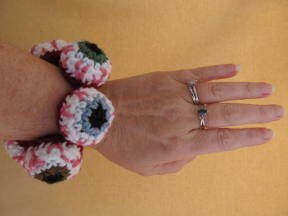 I came up with the Only Got Eyes For You Bracelet. Six eyeballs makes a good size for adults but four or five peepers would be better for child sized wrists. 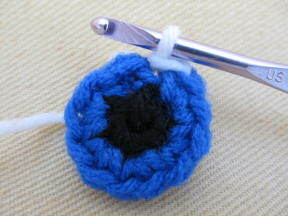 This pattern can also be easily adapted for headbands and necklaces too. I'll conjure up some directions for more options soon but until then, have fun creating as many eyeball accessories as you want! 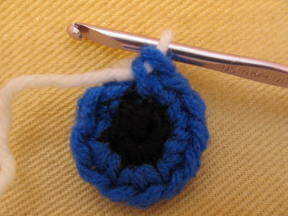 I'd like to share how to get the rounds of the eyeballs looking great when you're crocheting in the round. Changing colors doesn't mean you have to have an unsightly color shift. When changing colors, the normal technique is to pulling the new color through right before finishing off your stitch then moving along as if nothing happened. That creates a step or a jog as shown in the eyeball on the left. 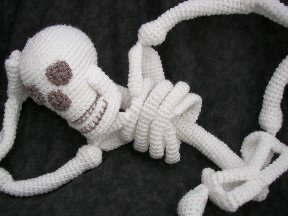 The way I do it – and there are other methods but this works very nicely for me – I change my color, pulling the new yarn through the loops to finish off the stitch. 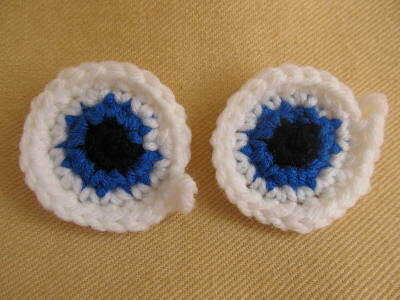 The result is the eyeball on the right. Instead of single crocheting in the next stitch, slip stitch in the BACK LOOP ONLY then continue to single crochet around your round. Leaving that front loop free works like magic, making a nice, even round. The eyeball on the right shows the result. There are no unsightly jogs and my iris and pupils are nice and round! Thanks again to Susan for inviting me to guest blog. I hope I didn't ramble too much! Thank you ever so much Deb. I hope you will check out her site. Thank you ever so much for sharing it with us!